The Fort Gordon FIT Club is an initiative of the Family and MWR Fitness Centers to encourage healthy competition by tracking mileage in three separate categories; biking, running and walking. This initiative is free and open to the entire Fort Gordon community. Participants will earn rewards for completing certain goals and attaining miles. In addition to recording your mileage and time, the Fort Gordon FIT Club app will also return your average mile time as well as average MPH for each workout. By setting your account to "Public", you are giving the Fort Gordon Fitness Staff permission to post your name, date of membership, and current mileage totals for the individual workout types (Bike, Run and Walk). These will be listed on a chart along with all other public FIT Club Members in order of mileage totals to encourage healthy competition. The Fort Gordon Fitness Staff has the right to refuse results if they are believed to be falsely recorded, such as recording a bike ride as a walk or by recording your time and distance in a motor vehicle. Please remember that the FIT Club initiative is designed to motivate fitness; cutting corners won't help anybody. If a workout does return unnatural results (Average running or walking speeds under 3 minutes per mile and average bike speeds under 1.5 minutes per mile), the workout will receive a flag (noted with a flag icon in the workout log) and may be excluded from total mile count. The Fort Gordon FIT Club app does not keep any records of your GPS coordinates. The latitude and longitude data is stored locally in your phone to calculate your distance. Once the workout is completed, the value representing the overall distance is sent to the workout log. Stationary equipment includes treadmills and stationary exercise bikes. A photo of the digital stationary equipment display is required for any stationary workout. Since distance can not be tracked programmatically, mileage must be entered manually. The photo of the stationary display provides verification of your mileage. These photos are available only to the Fort Gordon Fitness Staff who will compare the photo with the manually entered results. If the photo and manually entered mileage do not match, the Fort Gordon Fitness Staff has the right to remove the workout from workout log. Goals have been set by the Fort Gordon Fitness Staff for each of the individual workout types. 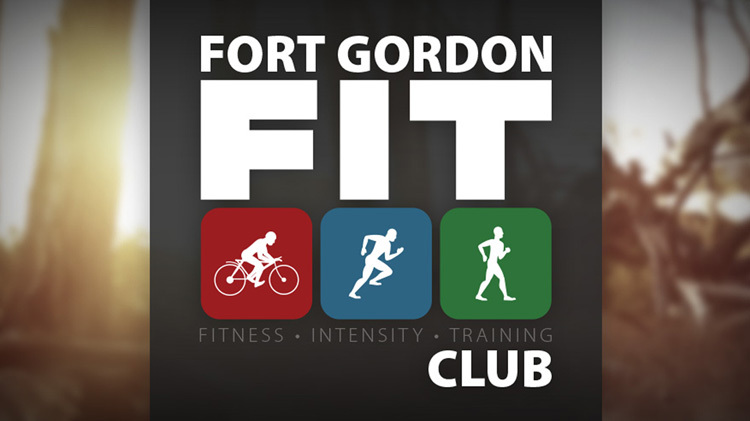 Although the Fort Gordon FIT Club app is open to everyone, our primary focus is on the Fort Gordon community. That being said, in order to be eligible to receive a physical reward for reaching a goal or an accomplishment, you must be in at least one of the following categories: Active Duty, Reserve, Retiree, Veteran, Military Dependent or DoD Civilian. Military or DoD ID card must be presented at the time reward is accepted. This goal must be met within a one year span (365 days) in order to receive a reward. Any workouts in the log older than 365 days will not be included in the total mileage. Limit of one physical reward per qualifying goal/accomplishment per year.